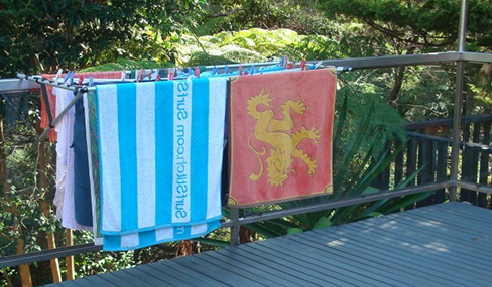 As the industry leader specialising in providing a range of environment-friendly clotheslines for the Australian market, Versaline developed the Hook&Away portable drying line specific for pool or spa area use. Versaline's Hook&Away clothes portable drying line is easy-to-use and can be hooked over any partition structure bordering a pool or spa area. It can be used on pool fencing, Colorbond or paling fences, brick walls, and glass panels. Hook&Away is a versatile portable drying line that can be used anywhere around the home where there is something to hook onto. Versaline's Hook&Away is built from anodised lightweight aluminium to suit sea-side areas or around salt pools. The Hook&Away is non-fixed and can also be folded flat for easy storage, which is ideal for apartment living and renters who can take it with them when they move on to another location. Learn more about the Hook&Away or any other Versaline products by visiting www.versaline.com.au. I would like to enquire about Versaline Clotheslines.